This is the hottest month on record. No, this is the hottest month on record. No, THIS is the hottest month on record! We got so tired of repeating those words that a few months back, we decided to consolidate our coverage of the planet-wide hot flash into a single post. This week, that post saw a disturbing milestone: the one year mark. 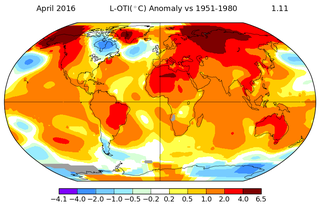 We just lived through twelve record-smashingly hot months, April to April. On top of that, 2016 is now all but assured to become the hottest year on record—stealing the title from 2015 which just became the hottest year on record. Will the sizzling streak ever end? Our planet could see some relief by the end of the year, if El Niño is overtaken by La Niña. But the effect would only be temporary. We’re currently on the tail end of a very strong El Niño event which is partially responsible for our record run of record hot months. El Niño, which comes every three to seven years, is characterized by a warming of surface ocean waters across the equatorial Pacific, an effect that disrupts atmospheric circulation patterns around the globe. Some parts of the planet become cooler and wetter, while other regions get warmer and drier. But on the whole, El Niño releases trapped ocean heat into the atmosphere, resulting in a slight uptick in global temperatures. La Niña brings the equatorial Pacific back down to a simmer. While the regional effects of La Niña are every bit as complex as those of El Niño, Earth’s thermostat tends to dial down a bit during La Niña years. After new temperature records were set during the 1997-1998 El Niño, a three year La Niña phase saw the planet cool slightly. Heat records were broken again during the 2009-2010 El Niño, but during the subsequent La Niña, global average temperatures fell by 0.1 to 0.2 degrees Celsius. What will happen as our current El Niño fizzles out is not yet certain. NOAA’s most recent models predict about a 75 percent chance of La Niña developing during the fall or winter—which sounds like pretty good odds. Even if strong La Niña conditions emerge by the fall, however, 2016 is still going to be a scorcher of historic proportions. That’s because the double whammy of a strong El Niño and the underlying global warming trend have resulted in a tremendous buildup of heat in the atmosphere. And that heat is going to take time to dissipate. In fact, Gavin Schmidt, head of NASA’s Goddard Institute for Space Studies, estimates a greater than 99 percent chance that 2016 will be the hottest year yet, given the incredible head start we’ve already had over last year. On the other hand, the emergence of La Niña conditions could pump the brakes on planetary record-breaking in 2017. It’s crucial to stress that any slight global warming relief in the coming year or two will be temporary. In the long term, our planet will keep heating up as long as we’re pumping carbon into the air, and there’s no indication that we’re going to stop anytime soon. We’re teetering on the edge of a world where atmospheric carbon concentrations are permanently above 400 parts per million; the highest they’ve been in millions of years. The rate of carbon emissions hasn’t been this high any time in the past 66 million years—since the dinosaurs went extinct or even earlier. And Earth’s thermostat is responding in a predictable way. Global average temperatures are now nearly 1.5 degrees Celsius (2.7 degrees Fahrenheit) warmer than they were in the pre-industrial past.